Duck hunters finished the season on S.C. Department of Natural Resources public hunting lands, with a total reported harvest 3,931 birds, an average of 2.0 birds per hunter. A total of 1,955 hunters participated in 125 hunts at the 16 Wildlife Management Areas that recorded individual hunt data. Gadwall accounted for 25 percent of the total harvest, followed by Wood Ducks, Northern Shoveler, American green-winged teal and American widgeon. Bear Island WMA near Green Pond had the highest total harvest with 1252 birds taken by 289 hunters, nearly 40% of them gadwall. “Overall the season for our waterfowl areas was excellent, the early cold weather fronts we had brought birds into many areas of the state before Christmas and many of our WMA’s had consistent hunting all season long.” said Dean Harrigal, Waterfowl Program Coordinator with the S.C. Department of Natural Resources (DNR). On Category I Wildlife Management Areas (lottery hunts), 901 hunters (on 11 areas) harvested 3,229 birds with an average of 3.6 birds per hunter. Gadwall, Northern Shoveler, American green-winged teal, and American Wigeon were top birds in the bag. “Several years ago Tommy Strange (retired DNR waterfowl biologist) said that Gadwall was the duck of the future for South Carolina and given the number harvested on our WMA’s this year, it looks like the future is now, “said Harrigal. Sandy Beach in Berkeley County had the highest hunter average with 4.6 birds per hunter, followed by Bear Island WMA in Colleton County with 4.3 birds per hunter, Santee Coastal Reserve in Charleston County with 3.5 birds per hunter and Santee Delta in Georgetown County with 3.2 birds per hunter and Broad River WMA 2.3 birds per hunter. Top individual hunt units were Springfield/ The Cut of Bear Island (4.7 birds per hunter), Sandy Beach (4.6 birds per hunter) Bear Island East (4.2 birds per hunter), Bear Island West (4.0 birds per hunter) and SCR the Cape (3.7 birds per hunter). Hunt data was collected on 5 of the 30 Category II Wildlife Management Areas (open to the public on specific days). Hunters reported a harvest of 702 birds on these areas, the vast majority coming from Hickory Top Greentree Reservoir. The average for 1,054 hunters was 0.7 birds per hunter. Wood ducks accounted for over 82 percent of the bag. A total of 41 special youth only hunts were held on select areas throughout the season. The reported harvest was 436 birds by 212 hunters for an average of 2.1 birds per hunter. 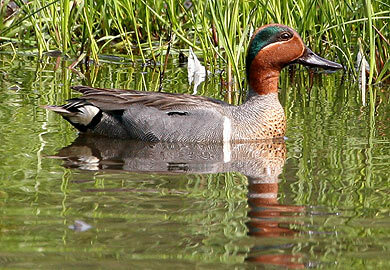 Gadwall, American green-winged teal and Ring-necked duck were the top birds in the bag. “We were especially pleased that our youth-oriented hunts provided quality waterfowl hunting opportunities for young men and women during the season,” Harrigal said. For detailed reports on the recent waterfowl season go to the DNR website. DNR to host youth turkey clinic April 25 in Chesterfield Co.